GreaterSkies. Established 2006. Capturing the stars of past or future.... We can capture yours too, day or night, anywhere on Earth! 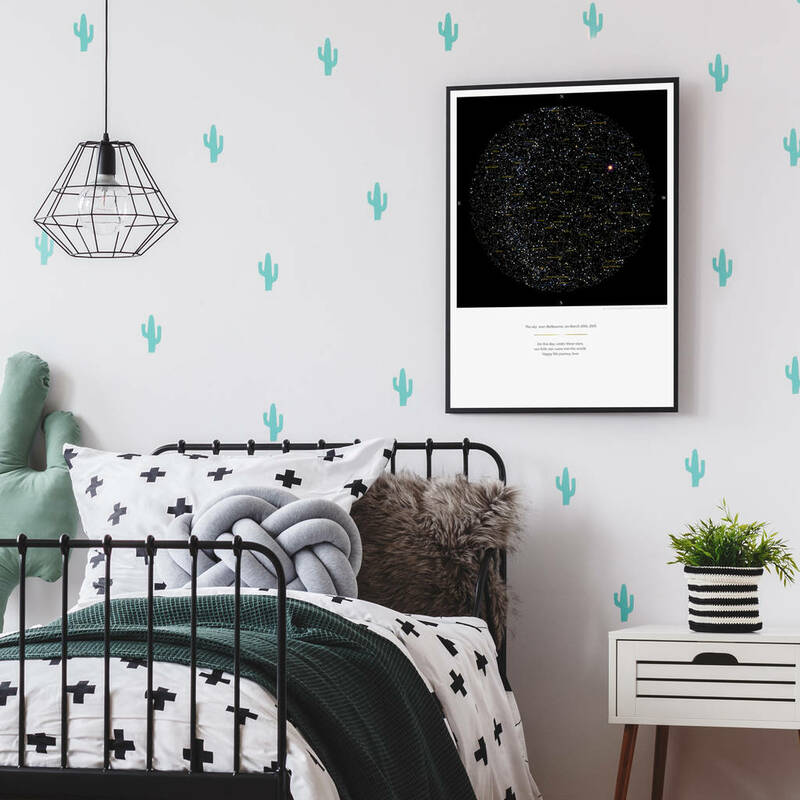 Stunning framed/unframed 50x70cm night sky print showing the stars and constellations over life's most special moments. A thoughtful, original personalised gift for any special occasion. Simply tell us from when and where you want to see the sky from and we'll take it from there. 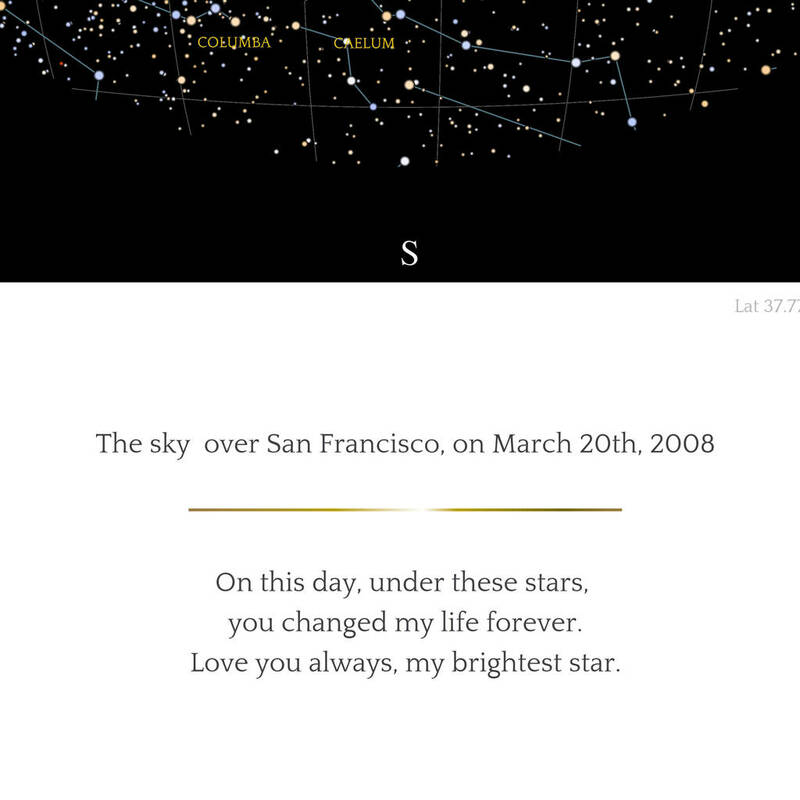 For a more personal touch, you can personalise the caption under the star map, and write a personal message of up to 5 lines. The coordinates (longitude and latitude), the date and time will always be printed in small font right underneath the map. ***NOTE*** If you wish the sky print to show the name of your chosen place or town (and/or the date/time), please add it in the caption text, eg. "The sky over Windermere on January 26th, 2019". 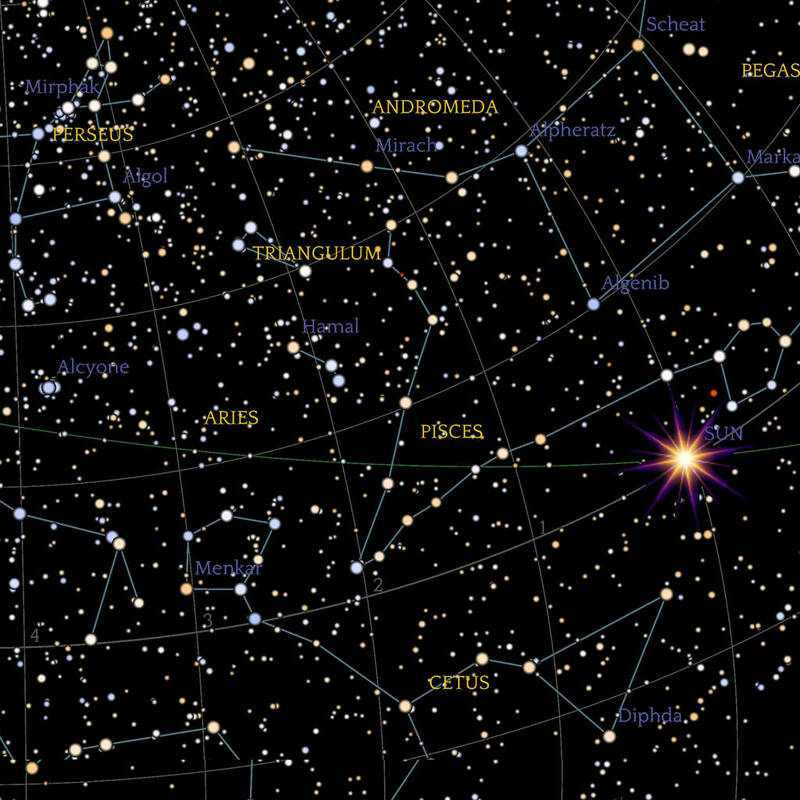 Our sky maps have the highest level of incredible details you'll find anywhere: 7,000 to 8,000 stars depending on your location, date and time; all the constellattions, the Sun, the Moon and the Solar System planets visible on the celestial vault at that moment. Plus, our maps are acurate down to the minute, so they truly show the sky over your special moment. Most other maps on the market do not ask you to indicate a time, only a date. Beware, this means that the map you get from most of our competitors can be extremely different from the true sky over your special moment. Because the Earth rotates upon itself, the stars and constellations visible from a given place on Earth change over time. 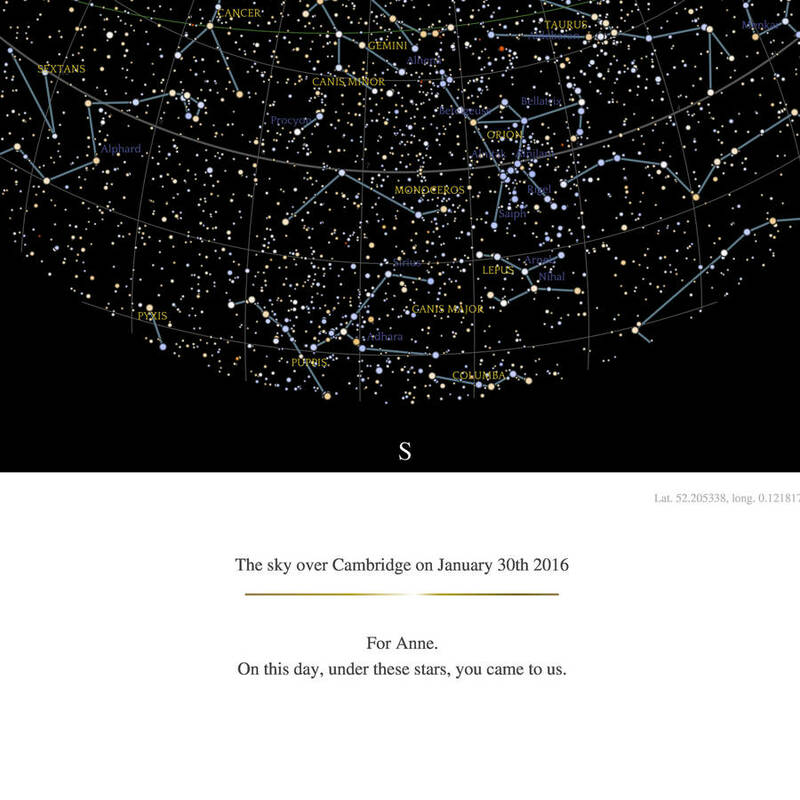 For example, the map of the stars over London on March 20th 2018 at 10am and 10pm look very different! At GreaterSkies, we give you the real stars and constellations over your special moment, not some approximation hours earlier or later. Create a perfect thoughtful gift to celebrate a birthday, a wedding anniversary, engagement, new baby arrival, Mother's Day or Father's Day, or simply to keep the wonder of a starry sky close to your heart for ever. For a wedding anniversary you can use for example: "On this date, under these stars, we joined our lives." 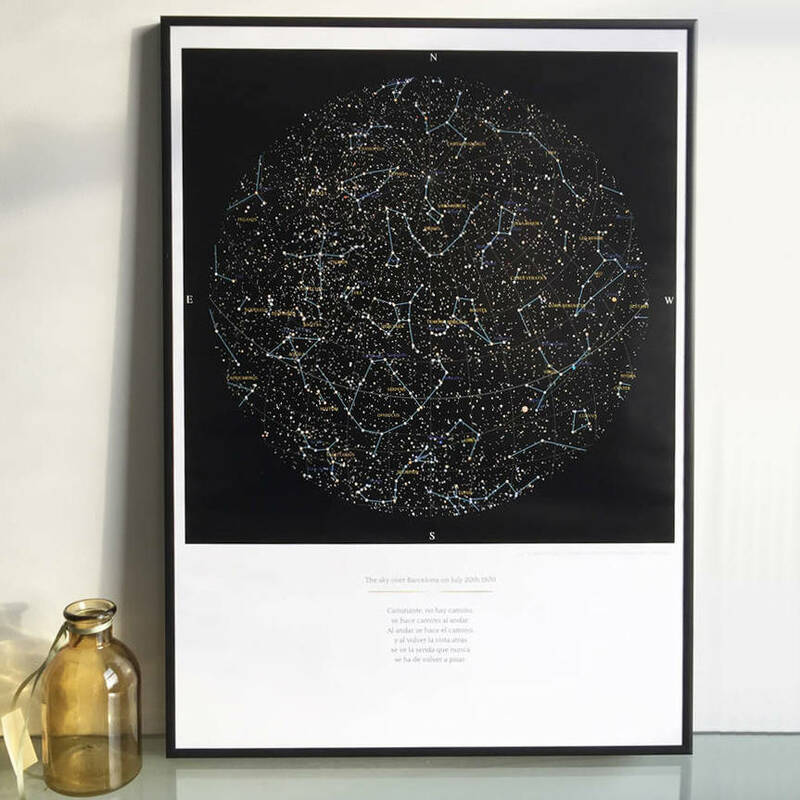 You sky map print comes unframed, or we can frame it for you. If you´d like to find your own frame, we've made it easy by selecting a size that fits many standard frames. 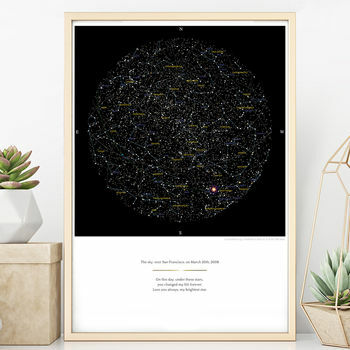 If you prefer the convenience of receiving your star map poster framed and ready to hang or offer, we'll ship it to you encased in a black frame. We also want to offer the best quality map around, and a keepsake that will last. That is why we print in high resolution on fine quality paper with inks that do not fade over time. Greater Skies sky map posters are printed in the UK on heavy-weight (260 gsm) archival quality satin photographic paper, using archival quality inks that will remain bright and beautiful for many years. A high-quality frame as option. The framing 'glass' is made of extra-transparent, thin Styrene which is thinner and more transparent than glass with a superior clarity. This product is dispatched to you by GreaterSkies.